This is a product review for Love Boo Super Stretchy Miracle Oil. This oil claims to have a unique combination of natural oils that prevent stretch marks and reduce stretch mark appearance. This product moisturizes and nourishes the skin helping to restore suppleness, fights aging, maintains an even skin tone, and restores skin elasticity. Continue reading this review to learn more about this oil. Caprylic/capric triglyceride- moisturizes the skin. Sweet almond (Prunus amygdalus Dulcis) oil- contains fatty acids that protect the skin from losing moisture and maintains a supple skin. Argan (Argania Spinosa) oil- nourishes the skin and improves skin elasticity. It also reduces wrinkles and fine lines. Tocopherol- reduces and eliminates stretch marks by stimulating skin cell and collagen production. Lemon (Citrus medica Limonum) peel extract- eases morning sickness. It also has cleansing and antibacterial properties. Lime (Citrus aurantifolia) peel extract- has a perky scent. It acts as a skin cleanser and conditioner. Ginger (Zingiber officinale) root extract- can ease morning sickness. Coconut (Cocos nucifera) oil- moisturizes the skin and protects it from the damage caused by free radicals. It also strengthens tissues and stimulates healing. Peppermint (Mentha piperita) leaf extract- has moisturizing capabilities. Its fresh scent eases fatigue and nausea during pregnancy. Mandarin (Citrus nobilis) peel extract- keeps your skin youthful and vibrant. Orange (Citrus aurantium Dulcis) peel extract- increases collagen production and discourages the development of wrinkles and fine lines. Apply a little oil wherever desired. Apply to damp skin after a bath or shower when the skin is warm and skin pores are open to absorb the oil. For pregnant women, this oil can keep away morning sickness because of its 100 percent ginger and lemon extract. Apply a little to pulse points. Take in some air when you feel nauseated. Massage it all over your body while concentrating on the tummy, breasts, thighs, bottoms, and hips. Apply twice daily to stop striae development. This product is safe because it contains natural ingredients. It is safe for both nursing mothers and pregnant women. The price of one 100 ml bottle is $20 while the price of one 50 ml bottle is $11. This is a reasonable price because the bottle is small. We did not find any discounts. Users who are not happy with the results can return the product for a refund provided the product is undamaged, unopened, and in the original packaging. This return policy is valid for 30 days starting from the date of purchase. We also found some positive customer reviews indicating that users are satisfied with the product. In sum, we believe that this could be an appropriate product for preventing and reducing striae because of its strong blend of natural and effective ingredients. The merits of this product include the use of safe ingredients and positive reviews from users. However, there are no price discounts for products bought in large quantities. In addition, it is not clear whether the manufacturer is GMP-certified. As a result, it might be best to keep shopping around for a different option. 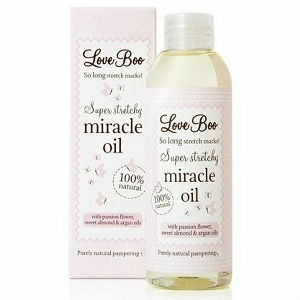 David Carney	reviewed Love Boo Super Stretchy Miracle Oil	on August 15th	 and gave it a rating of 3.